What could be more Dutch? Even for those who hate fish, pickled herring is surprisingly sweet and non-offensive. If you’re walking around day-time, you might see a stand that sells haring (herring in Dutch). You can have it raw, pickled, or even whole with onion on a sandwich (or without), but you’ll find it’s ridiculous inexpensive and pretty tasty. Click to read more about Dutch haring! This Dutch bagel chain all over the Netherlands has stolen my New Yorker heart with their toasted everything bagels with hummus and rocket. The best part: A bagel with a heaping portion of hummus is less than 5 euros. Note: for more vegan and vegetarian specific tips, you can head over to my post just about vegan food in Amsterdam here. After wandering around the lovely canals or waiting in line for hours at the Anne Frank House, be sure to consider eating a tasty meal in the Jordaan. Prinsengracht is the most well-known canal, however there are smaller canals perfect for sitting by with cheap food in Amsterdam! Indonesian is something you must try while in Amsterdam. I’m obsessed with Eethuis Pondok Indah. You might have walked past this small hole-in-the-wall eatery on Prinsengracht without a thought, but I promise it’s the real deal. Pieter (above) and his wife proudly serve up some of the most affordable and delicious Indonesian in Amsterdam. You can pick what you want from a selection of vegetables and meats although I’ll admit to being obsessed with the tempeh (tofu). Pittig is the word for spicy and don’t ask for it if you don’t mean it! Only 6.50 for a medium box with a meat of your choice. If you’re not sure, just ask. Open for dinner. Bring cash as they do not accept credit cards, only Dutch debit cards. I recently visited Simz Exotic Foods in the Jordaan. This charming little cafe serves Surinamese food. Many tourists don’t realize that there are many people of Surinamese descent living in the Netherlands due to the Netherland’s role in colonizing Suriname. Although Suriname is located in South America, the mix of cultures has resulted in unique flavors that combine Indonesian, Indian, and African inspired flavors. Simz has a fantastic lunch special where you can get a delicious vegetarian-friendly tempeh sandwich for around three euros. I recommend also trying bara, a fried Surinamese bread/donut. (You can get this with a banana or peppers/sour sauce if you enjoy spicy). If you’re hungrier, they also have entrees that can be purchased for take-out that will give you a taste of several dishes that you can choose from. There are a number of small tables inside, however on a nice day, I’d recommend getting your food to go to enjoy on a bench along the canals or at your hotel. Surinamese food can be spicy, so specify if you want any extra hot sauce. Be sure to have cash as they do not accept credit cards! For cheese lovers. Trust me, you don’t need to go to Alkmaar or Gouda to have fresh cheese. This Dutch cheese shop is open until 7pm most nights, accepts credit cards, and is happy to give samples. It’s only about ~3 euros for a huge portion of my favorite dairy-free cheese. At lunch, they also serve sandwiches for under 4 euros. Open for lunch and dinner. Apple Pie. What could be more American? 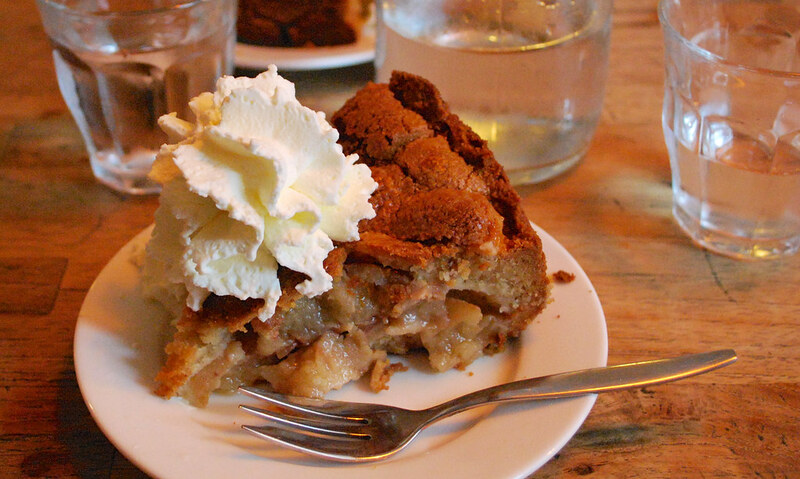 Just kidding, apple pie with this type of topping is VERY dutch and so good. Together with a mint tea, you’ll satisfy your sweet tooth for about six euros with a fantastic view of the Jordaan. Perfect for after browsing the Lindenmarkt weekend market. Although I don’t personally go to Centre often, tourists spent a lot of time in this area and there’s some cheap places to eat in Amsterdam’s center. If you’re exploring the Bloemenmarkt, this cozy Dutch cafe on a hidden side street off Spui has a reasonable lunch-time menu, including tasty Dutch pancakes and reasonable sandwiches. There’s a friendly bar cat who likes to rub against customers when he’s not sleeping near the bar. Perfect for a post book browsing lunch. This is technically high-end, but these are the most famous cookies in Amsterdam. It’s only two-ish euros for one large, rich, and delicious chocolate cookie with a molten chocolate center that is made fresh for every customer. Just be warned that having just one is difficult, but it is not to be missed. (Open until 5:30pm most days.) Close to the 9 Streets. This cool bakery mostly in Centre has delicious macarons, pastries, and cookies you won’t be able to resist. At lunch, they also have reasonable sandwiches as well as organic snacks. I have a minor addiction to their homemade chocolate bars. This small gezellig cafe in the slightly hidden Prinseneiland area has brunch, lunch, and tapas for 9 euros for anyone looking to “splurge” (this is a budget guide!) on a high-end yet inexpensive meal. Their meals are very creative. Perfect for a meal for you or your foodie travel budd(ies) away from the crowds. Under five euro Vietnamese Banh Mi Sandwiches. Need I say more? There’s a branch in the heart of centre at Zeedijk, a short walk from Centraal Station. Lunch & Dinner. Accepts Credit Cards​. One of the legacies of Amsterdam’s liberal policies in the early 20th century was allowing people to inhabit abandoned buildings as a way of prevent buildings from staying abandoned past a year. However, squatting is now illegal in Amsterdam. ​ A handful of organizations have tried to keep these former squats as the former public spaces they were prior to the law change. OT301 is a restaurant (on weekends), bar, public space and artist studio. In addition to having awesome graffiti, a cool vibe, it has a non-profit kitchen called de peper on Fridays & Saturdays by volunteers where you can get a soup and a delicious vegan meal for 6 euros (cash only). ​Make a reservation. This small Greek restaurant is the real deal. Its owners are proudly from Cyprus and they make everything in the back (you can watch). There’s a couple of tables and ten euros worth of items will fill you up for the entire day. Their chocolate cake made with honey is heavenly. This Moroccan restaurant has a delicious chicken sandwich with fries for a ridiculous reasonable price. I’m totally addicted to the spicy sauce that goes on the chicken and the appetizers. Be sure to have the Moroccan mint tea. There’s multiple branches around Amsterdam. I couldn’t leave off Surinamese Roti, a must-try food while in Amsterdam. It’s typically about 6 euros for a huge roti bread with with chicken, curry sauce potatoes, and green beans. Roompram Roti is close to the Albert Cuypmarkt and absolutely delicious. Bazar Amsterdam is a beautiful Mediterranean restaurant with a huge menu in a former synagogue. The setting is absolutely fantastic with many decorations and it’s about 8-10 euros for more food than you could eat in a day. Lovers of Mediterranean food, rejoice. Sir Hummus has home-made hummus and pita for 6.50. Simple, delicious, and a quick walk from the bustling Albert Cuypmarkt. There’s now a second location. Sari Citra is one of those hole-in-the-wall places that you walk by wondering if it’s any good. Sari Citra is one of the best places to eat authentic Indonesian food in Amsterdam. I discovered it on my first trip to Amsterdam and numerous friends/strangers have confirmed my suspicions that this take-out eatery is the real deal. For a beautiful and healthy meal, look no further than InStock. It’s a non-profit restaurant that strives to prevent food waste by using the leftovers from Albert Heijn. The three course meal is about 20 something euros, but the main course is usually around 10 euros and the portions are ridiculously reasonable. Only a 5 minute walk from Brouwerij ‘T Ij (fantastically inexpensive beer!) is Boi Boi, a Thai restaurant that has a 10 euro dinner special that changes daily. Tasty and always a surprise! Good lunch special too. The obsession of many Dutchies. You’ll see this chocolate brand all over the Netherlands. It is the FIRST slave-free chocolate in the world and their milk caramel-sea salt bar is to die for. I don’t even like caramel sea salt generally, but I love this chocolate and have it daily. Really. It’s usually between 1.50 to 2 euros for a small bar. They have seasonal flavors around Easter and I highly recommend it to any chocolate lover. Drop. Affectionately called “Engels Drop”, these licorice candies are only a euro at the supermarket and drugstores. Perfect for your licorice loving friends. Click for more Dutch foods to try in the Netherlands! If you want the cheapest beer, just ask for a beer. They’ll give you whatever is on tap and only typically ask for the size of the glass. Typically, it’s something like Heineken, Jupiler, or Grolsch, which are all decent beers if you’re not particular about it. Click for a complete beer guide to Amsterdam. Don’t miss the Rolling Kitchens (Rollende Keukens) food festival if you’re visiting while it’s going on in May. It’s a FREE food festival where you can roam the grounds and try inexpensive food from all the around the world made in food trucks. My friend Olga (from Dreams in Heels) was lucky enough to experience this for herself! Amsterdammers and visitors, what do you think? Why oh why didn’t I have this guide when we visited a few years ago?! Thank you for sharing your recommendations! When I was in Amsterdam we visited a restaurant that was by the pier and made of shipping containers – have you been? Albert Heijn is definitely great for some take away options, my husband has their salads frequently. Eetcafe ‘t Pakhuis is an awesome spot that is cheap and good and I highly recommend it as well. Haven’t been to many of the other restaurants though. Great roundup, hunting for cheap eats in Amsterdam was a bit of an obsession of mine while saving up for my travels… I also frequented the Stadskantine for cheap but filling eats (especially if I wanted to combine it with working remotely), Warung Spang Makandra near the Albert Cuyp for dank and cheap Surinaams/Indo, and Mitsos Traiterie in Hugo de Grootplein for the bestest (and cheapest, and friendliest) Greek eats in Amsterdam. I LOVE Tony’s Chocolonely caramel sea-salt!! Coming from Australia I really miss Australian chocolate and this was the first chocolate I’ve had overseas that was as good or better! Also, great tips for Amsterdam, will save for the next time I’m in the city! Oh, that cheese! And In Stock looks incredible! I’m hoping to head to Amsterdam soon, so many of these are definitely going on my list! Oh my goodness this left my mouth watering! It’s so great to see a guide on where to find cheap and yummy eats in a big city, so useful to have for someone that’s travelling on a small budget! Thank you so much, will definitely be using this in the future! What a fantastic round up of budget eats throughout Amsterdam – great suggestions. I will have to pin this to save it for my trip next year. That apple pie looks divinely delicious…ohhh and that cheese – yum! Thank you for sharing these. What a great guide! I’m bookmarking this for when we go to Amsterdam next time. I’m just back from the Netherlands and was telling my husband about the 14eur 3-course dinner we had there. Here in Belgium you hardly get one dish for that price… It seems like Holland is much cheaper when it comes to eating out. great tips and pics! what an extensive list, wish I knew about this when we visited last year. I am particularly interested in the bagel eatery. if a fellow new yorker says it’s good, then I know it’s the real deal! This took me back! You’re so right, my mum is Dutch and brought me up on chocolate strand sandwiches and Albert Heijn. Glad you included the Indonesian influence which is also delicious.